The video was shot by Adam Cox, of the Wakaleo Animal Channel at the Australian Bat Clinic & Wildlife Trauma Centre in Advancetown, Australia. The centre took in these babies when their mothers were killed after an extreme heat wave. Swaddling the bats in fabric helps to nurture the infants until they are healthy enough to be released and survice into the wilderness. 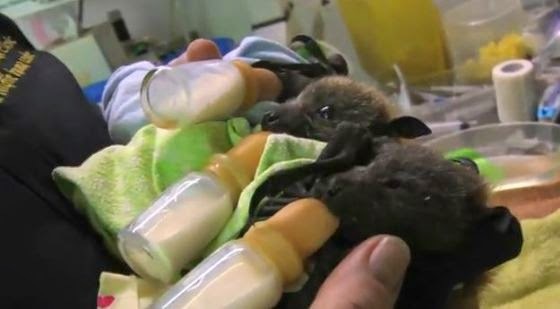 The Australian Bat Clinic and Wildlife Trauma Centre is a nonprofit organization, and is supported entirely by donations. So if you want to help them to save even more helpless creatures please consider donating by clicking here! Bumblebee Bat: Meet the world's smallest bat! It's super tiny.